Just wanted to post this link with the Circle of Eight blogspot. 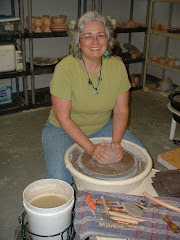 I have work at the Pullen Arts Center in Raleigh with them this month and you can see one of the pots. It's in the last photo, and is a vase form with carved background and pomegranite fruits and vines. Thanks for asking me to show with you all! This is one of three plates I was commissioned to make for someone who wanted to share the sentiment of friendship with two good friends. I will be taking the finished pieces out of the kiln today. Can't wait to see how they turned out. The last week has been very busy with making and firing new work. The kilns are probably waiting for a rest, but it's not in sight yet. I have gotten a few moments to work on new pieces and have lots of ideas just waiting to bust out when I get some time. I think I will end up choosing a day for experimentation and trying to stick to that with discipline, in order to keep things fresh. One of the great pieces on display at the Utilitarian Clay. Sorry that I can't place the artist for you. This was the cup/mug that I received in the mug exchange at the Utilitarian Clay Conference. It had a little piece of paper with the potter's name on in, but I misplaced/lost/washed/can't-find-it now. So I was wondering if anyone knew who might have made it. I have enjoyed using it at the conference and have it at my studio for my afternoon snack. Thanks to this unknown craftsman! Some sketches I did while at Arrowmont, based on a book of Japanese tree motifs. I think these reflect some of what Michael Kline was saying about reduction down to lines and dots. My goal is to translate some of these into small trays. Stacking bisqued pieces that Catherine made in a Create in Clay kid's class. I love the freshness of these pieces. Should make an awesome dog totem pole. An elegant handle on a Bruce Cochrane covered dish being supported while drying. Michael expounding on dots and lines. Slip painting from yesterday. We will see how they turn out as far as color. Today I did 2 more of these size plates. The theme today was Paper Lanterns and Pine Tree branches. I am using the blue, green and white slips I mixed up a couple of months ago. Added some grey and mixed in underglazes for the paper lanterns today. A thought I have been having is whether I could paint some of my glazes on the the greenware and then bisque fire. They are not formulated for once-firing and I wouldn't actually be once firing, but don't know if they would crack or cause problems with the clay. Only one way to find out. But if any of youse guys out there have tried this with good or bad results, I would appreciate knowing. My thought is to cut out some of the time consuming layering of glazes. A couple of professionally made photos of pieces for my wholesale webpage. I think Randy did a fantastic job as always. I will be using the top photo for a postcard for my fall sale. Jen Mecca will be my guest artist and I'm very excited about having her work in the gallery. 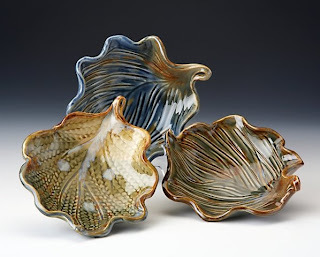 If you aren't on my mailing list and would like to be, just email me (bluegillpottery@bellsouth.net) and I will add you. I love getting cards from other potters and artists, myself. In fact I have a wall of laminated postcards in the studio that serve as inspiration. Today I was finishing up orders, but did get to experiment with colored slip on plates like those above. I mixed some grey slip as a background color for a plum blossom plate. Then I did a dark background with a greyed out bare tree and snow drifting in the wind. These images have been in my mind for quite a while. If they turn out, I'll share some non-professional images with you. I am back from the clay conference and really enjoyed it. I had a hard time choosing between presenters, but was able to spend much time watching Bruce Cochrane, Lorna Meaden and Michael Kline. The rest was spent flitting in and out of studios, looking at assembled work and enjoying the atmosphere and library of Arrowmont. Lots of pictures, lots of which are represented on others' blogs, so when I post I will try not to be redundent. Today is gloomy and raining here, which is the perfect weather for me to be in the studio working. I have orders for galleries and individual orders, so it's off to the list of "things to make" for me. I'll share an idea about decoration that Michael Kline said. He said everything was "lines and dots", when you get down to the basics. That was very interesting for me, since I had just come from sketching some Japanese decoration of stylized trees in a book at the Arrowmont library. The ones I loved the most were indeed just lines and dots. Jim is filling up my tires and checking the oil in the van as I type. I will be going to the Utilitarian Clay Conference at Arrowmont tomorrow. I'm excited--heard much about it but never been. Well, must go pack and finish up those last minute things. Will send some images down the cyberspace highway either during or just after the conference. Hey, thanks for any comments during the last week or so. I was out of town and tested out doing some blogging with scheduled posts since I wouldn't have internet access. So much to say and no way to say it! Anyway, back for a bit. Had a great kiln firing. Will have a post a photo of the pitcher after firing. It turned out very nice. 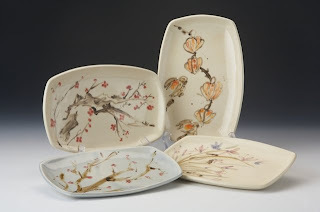 I had a chance to go back to the Mint Museum and see the Pottery Invitational. It was nice to see Michael Kline and got a little jewel of a pot. Will post that later, as well. I love the colors of these platters and the lively way that plants were treated. Can you see the knot in the stems in one of the platters? Do you think this guy was pleased with his portrait? Sadly, I did not make notes as to country of origin or dates. These are majolica or faiance (spelling?). You can pronouce it MAY-O-LICA or MAH-JOL-ICA, either one works for me! Again, at the Mint Museum. Gosh, just think of all the pieces awaiting you. Go take a tour and see some great pots!